To raise awareness of the risks associated with working near underground services, we are expecting our partners to take part in a Services Avoidance ‘Going Underground ?’ Campaign with a safety briefing during the week commencing 11 May 2015. The briefing includes a film based on a real event and is aimed at all project employees and delivery partners. The campaign will continue through a 3 month period with regular updates, provision of best practice, knowledge share and finally a review of the Raising the Bar 9 – Underground Service Avoidance. · 113 service strikes have been recorded on the Highways network over a period of the last 18 months. · 49 of these strikes were due to poor planning or failure to follow procedures. It is important that we look at how we plan our work and the procedures that we have in place to prevent any further strikes. This campaign is aimed at us stopping and looking at what we do and how we do it. Most importantly we need to speak to those who do the work as they will have valuable ideas to contribute in making working around services safer. 11. Links to news stories about service strikes. As we move into the second month of our campaign to help raise awareness of the risks associated with working near underground services we are going to focus on the role of the designers, client responsibilities and working with Statutory Undertakers. A powerpoint presentation is available this month on the above topic. BPAUS 04 is a series of checklists devised by the USAG working group and aimed to be used by clients, designers and contractors to improve the control over works in the vicinity of underground services and reduce the number of strikes leading to injury and damage. Each of the three checklists provides a series of prompts to ensure critical control points have been considered. 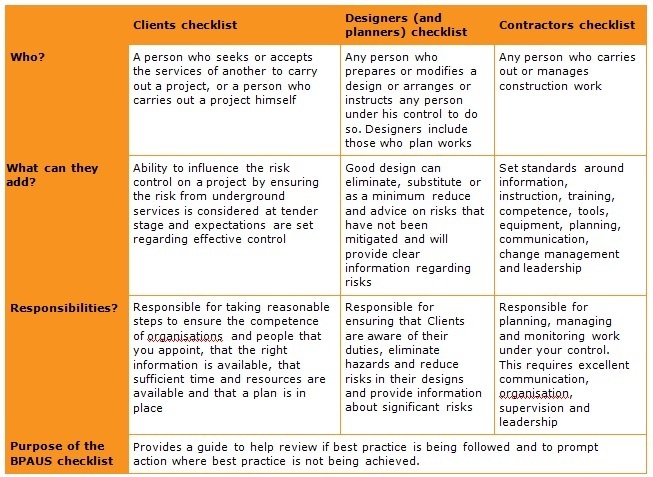 Will you start to implement these checklists on your project? Do you understand the purpose of the checklist? Included in this month’s uploads is a document explaining the USAG Charter requirements and how LinesearchbeforeUdig works. Many contractors have already signed up to the USAG Charter and have changed their procedures in accordance with the requirements. Working with common standards may be the way to go to prevent Service Strikes. Also this month - Have you considered the following? - Who is the appointed underground services co-ordinator on your site? - Is the co-ordinator competent, experienced and have they completed the required training? As we move into month 3 of the campaign to help raise awareness of the risks associated with working near underground services, we are going to focus on monitor and review. We would like to encourage all our supply chain partners to send in their best practice so that this can be shared. A series of “lifesaver rules” are to be developed throughout month 3 of the campaign. Here is the survey link, we really want your feedback !